Merry Christmas! 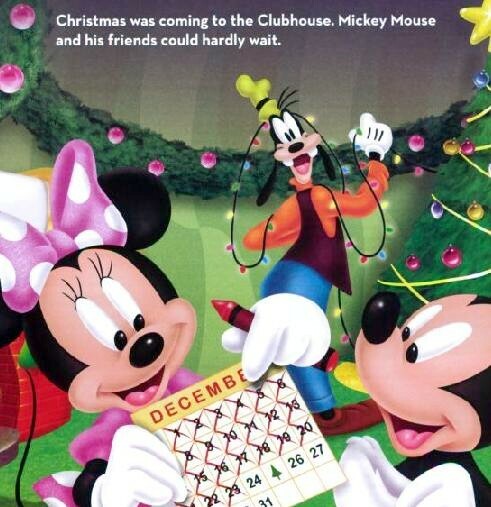 Join Mickey and Donald as they journey to the North Pole, to help Santa fix his broken sleigh. Find out whether the Clubhouse crew saves Christmas in this new storybook based on the hit DVD. The premiere of Mickey Mouse Clubhouse delivered the highest ratings ever for a Playhouse Disney series premiere among Kids 2-5, Girls 2-5, Households, and Total Viewers. It also premiered at #1 among all basic cable networks in its time period for Kids 2-5. Mickey Mouse Clubhouse shows no signs of slowing down as it settles in to its first season. It was in the Top 10 shows with Kids 2-5 for the month of May--tied with Spongebob Squarepants! This is a great book for little kids. It teaches children that giving is more important than getting. One of my favorite Christmas books. It shows how Donald learns from clues that his friends sold their favorite things to buy him a golden penny bank for Donald. He uses his prized pennies to buy back all the things they sold to get him a gift. Excellent book.